The new Hutech solar autoguider? - Page 2 - SolarChat! The new Hutech solar autoguider? Re: The new Hutech solar autoguider? great to hear. do they work with a G11 ? What is needed next to the autoguider ? 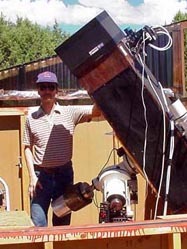 Can I ask you a question about the Hinode Solar Guider? I have one since years, and it works still perfect. There is a long white cable from the Hinode to the handcontroller. I will make a very short cable from about 6” cable (cord) between the two connectors, because the controller is now mounted on the telescope. So my questions are: *Do you know the perfect name of the original connectors that are used on the original white long cable? *Do you know the name of this white cable (cord)?